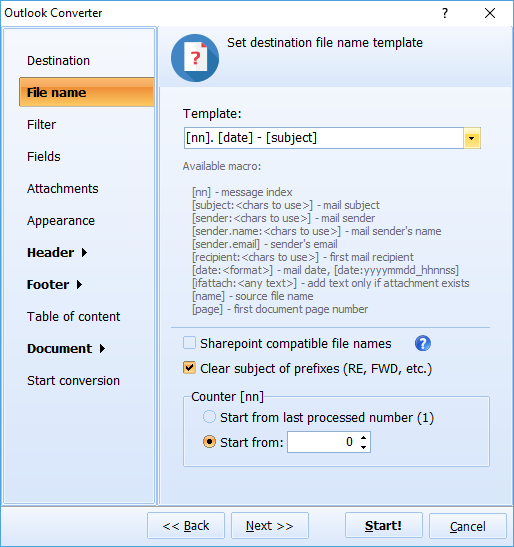 Convert Outlook emails with attachments to PDF, DOC, TXT, EML, etc. eDiscovery and litigation. Convert Outlook emails to PDF in the most accurate way. Attach or embed attachments to the resulting PDF. Search emails by sender, subject, date or any key word. Our Outlook converter can also stamp bates, add text watermarks (i.e. confidential), rename output files by the bates number. Migration. If you feel it's time to migrate to another email app, Total Outlook Converter Pro will export emails to universal EML files or MBOX accepted by Apple. Table reports. Get all emails from a PST file converted over to a single excel file with general info such as date/time/to/from/body information. Then it's easy to load the report in a DB or do further analysys on. Archiving old emails. Once you decide to empty Outlook and save copies of your emails on your hard drive, our converter is at your fingertips. Save Outlook emails as PDF, PDF/A, DOC, TXT, HTML, TIFF, JPEG files to open them without any email program. Elderly parents living far or kid's educational bills, anything you may find important should be backed up in case you don't have the Internet connection. All unique options..
Our app is your safe choice to save Outlook emails as PDF files, as you can rest assured that your data is handled with 100% accuracy during the conversion process. Back up, archiving, any legal matter - Total Outlook Converter Pro works with gigabytes of emails. Get your copy now, you are covered with the 30-day money-back guarantee. "I only convert Outlook emails and never tried OST and PST files. At least it worked fine when I did use (definitely cannot say that about a lot of other Outlook converters out there)." "This is a terrific piece of software. It saved our company days worth of work hours that we would have had to spend to move thousands of documents we had stored in Outlook to a network directory. The one thing that could have made it even better would have been if it could open the public folders directly. I had to export the contents of the public folder to a .pst first before converting the emails and attachments to .pdf files." 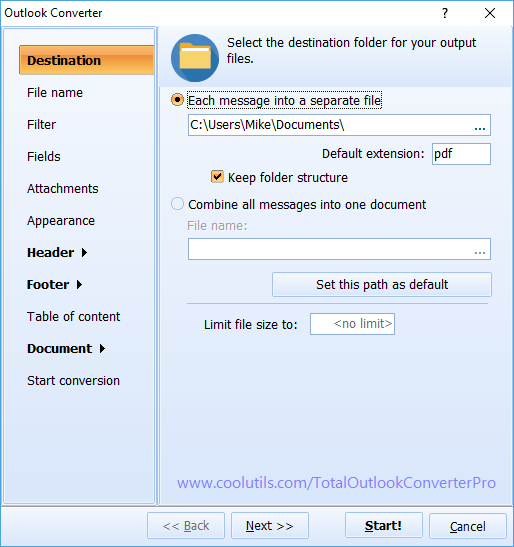 Total Outlook Converter Pro connects to your Outlook and gets emails automatically. The app takes the copies, the original emails are still there. You can import your PST or OST files into the converter too. Output file types include PDF, PDF/A, DOC, RTF, XPS, HTML, XHTML, TXT, TIFF, JPEG, EML, MBOX. Total Outlook Converter Pro does not require Outlook or any other additional library to convert PST files. Search emails by sender, date or key words. When you want to find specific emails from a certain sender or date or having a key word in Subject, use our powerful Filter option. Filtering email by size is also allowed. On top of that, Total Outlook Converter Pro can search emails by keywords in the body of the message. Tune the data saving options - save only necessary data from your emails. With Total Outlook Converter Pro you can convert whole emails with attachmnets or only selected fields (Sender, Recipient, Date, CC). Save space and get rid of the data you don't need. Our flexible Outlook converter can include the sender's IP address to the output file. The converter will include RFC-822 headers to output files if you want. There is a special option: "do not load images from the Internet". You can save time if you tell the app to skip the links in the emails that lead to images in the web. Total Outlook Converter Pro perfectly maintains the folder structure. Powerful formatting options - you decide how your files will look. Total Outlook Converter Pro can add the date, time, counter or any text to your documents. "Page X" and "Page X of Y" are supported in page counters. You can start enumeration from any number and check sequential numbering if you don't want the system to start over at each new folder. Legal users can easily stamp bates onto emails to make e-discovery and production very easy. Bates numbers can be embedded into the file names too! Image watermarks are supported. Add your logo, QR code or any image to resulting files. You set the position of the watermark on the page. With Total Outlook Converter Pro you can set the font, size and color of text to your standards. Customize the default internal scheme or add your own external CSS scheme. Converting emails with different attachments, check the fit-to-page option to get the proper view. With this Outlook converter you can combine emails into one multi-page PDF or TIFF file. For PDF files you set the compression level to optimize the file size. Add a Table of Contents for easier navigation when you combine several Outlook emails into one multi-page file (works for PDF only). 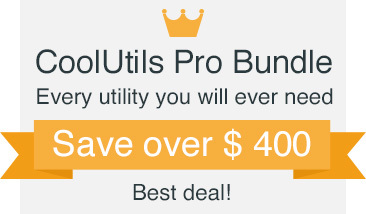 Fair Pricing - pay once for a lifetime license. Total Outlook Converter Pro is competitively priced; a one-time payment gives you lifetime license. Moreover, we offer all major upgrades released within 12 months from the purchase date absolutely free. There is a 30-day free trial version with full functionality available to make sure the program converts your Outlook emails all right. Total Outlook Converter Pro can be run via a command line if you convert PST files (you don't even need to learn the parameters). We also offer our SDK to developers. If you need the Outlook converter's functionality in your app, contact us for more details. Fast batch conversion - convert thousands of emails at a time. 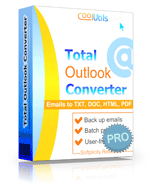 Total Outlook Converter Pro converts emails in batches. There is a handy Check All button to avoid clicking on every email you want to process. Contacts can be converted as well. You can limit the size of the resulting files. Some emails can have huge attachments, so it can be necessary to set the limit of the output PDF to 2MB, for example. If the file is larger, it will be split into two PDFs. High security options - be on the safe side. Worried about the security of the output files? Total Outlook Converter Pro gives you total control over permissions to open, view, print or edit the PDF copies of your emails. The app will also help you sign files with your digital signature. PST to PDF with the Fast Web View option. File naming and date swithing options to help you organize your output files easily. Total Outlook Converter Pro adds a new name to each output file using any template you set. Add a counter to the file names for easier file sorting. Or include the date to the file name. If you stamp bates, you can insert the bates number to the file name. The Sharepoint-compatible names option will make sure that non-supported symbols are not added to the file name. You can choose to clear prefixes from the subject (RE, FWD, etc.). Total Outlook Converter will keep your date stamps intact or switch all emails to Coordinated Universal Time for managing emails received in different time zones. Attachment saving options a la carte - how would you like to process attached files? Attachments can be saved as their original file types to the same folder or to a new one. In PDF you can get the attached files in the resulting file as a clickable link. They will be opened in the corresponding program. Zipped attached files can be extracted. Total Outlook Converter Pro allows you to include a reference to the attachment in the email summary that appears in the header (attachment info). When you convert Outlook emails with attached images, the images can be embedded into the output file. If image attachments are too big to fit inside your target document, the app shrinks them down to a more manageable size that will fit your page. Total Outlook Converter Pro can convert attachments to the same file type as the email and embed them or place to a designated folder. It's handy to have all correspondence in one file type! Embedded attachments can go before or after the email body. If your emails have other emails attached, they can be converted and renamed according to your settings too. You can rename attachments including the email name or the counter of the corresponding email, so that you will always know which attachment belongs to which email. Trust - rely on CoolUtils. Coolutils has been in business since 2003; we are well-known experts in file conversions. Over 24,000 users worlwide have chosen Total Outlook Converter Pro: home users, law firms, hospitals, government institutions, small and large corporations convert Outlook emails with our app. If you need references, please, contact us. Enjoy clear user-friendly interface with hints for beginners. 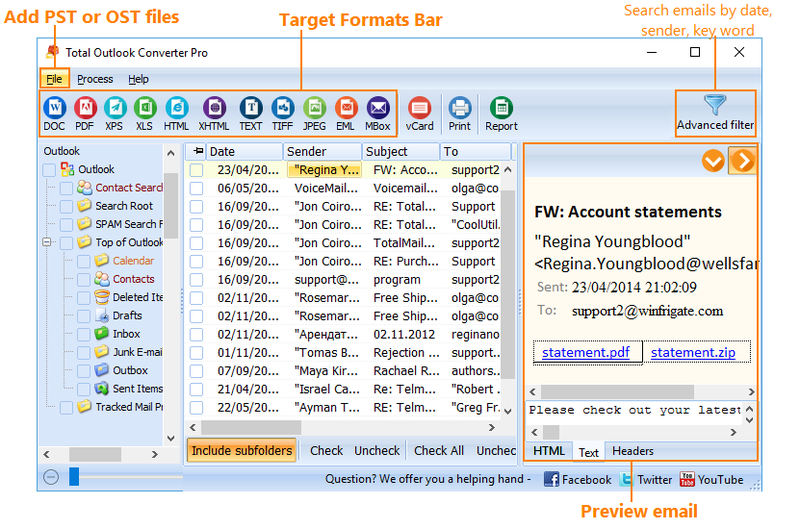 Total Outlook Converter Pro is proud of a clear, easy-to-follow interface. New users can rely on default settings. We provide 24/7 email support to all our users. You are also welcome to leave voice mails (1 855 418-2323), we will call you back the same day. Convert PST to PDF, DOC, TIFF, EML. Convert OST to PDF, DOC, TIFF, EML. Attachments can be converted to DOC, RTF, TXT, HTML, HTMLX, JPEG, TIFF, PDF. Attachments can be saved as new files with new descriptive names. Migrate from Outlook to MBOX. Converts all *.pst files in one folder. Stamp bates or add legal notes.